God is a creative God and we are made in His image, thus creative ministries are an important part of church life. Through music, drama and dance, we love being in God’s presence and creating an atmosphere where people can connect with and experience the living God. 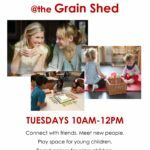 Grain Shed Kids is the name of the Children’s Ministry at The Grain Shed Church of Christ. We believe that the parents are the primary disciplers of children and we aim to partner with them in seeing their children grow to love Jesus. We run a Kinder Kids program for preschoolers (1-4+ year old’s) and a Primary Kids program for Grades Prep to 6 (5-12 year old’s), at 9a.m. and 10.30a.m. each Sunday during school terms. It is our goal at Grain Shed Kids to strengthen and equip children as they live out their faith at home, in their community, and in the world. 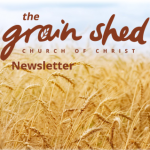 Grain Shed Youth exists to champion the cause of the Church’s NOW generation! Our ministry endeavours to allow our youth to meet Jesus in a very real and personal way. If we are not continually pointing our young people to Jesus then we are not fulfilling our ministry’s goal. We desire to show our young people that their age is no barrier to being an active and powerful disciple of Jesus. Through a real relationship with Jesus, our youth will experience change, from the inside, out. We meet weekly on Friday evenings through the school term.